Social media can often be a wonderful thing. Bridgeport High School alumna and current West Virginia University freshman Emily Ogden is proof of that. Before we get to why, a little refresher to set the stage. Ogden is a member of the “Pride of West Virginia,” which for those living in a cave or really new to the area or just stopping by is the WVU Mountaineer Marching Band. Because of her affiliation, she’s been to a whole lot of WVU football games this season. One of those games included the Nov. 23 game in Morgantown against Oklahoma. The date is important to note for purposes of this blog. Earlier this week, on Wednesday to be exact, the Big 12 Conference that WVU is part of decided to raise the bar of absurdity and stupidity when it announced that WVU’s last regular season opponent – Oklahoma – will be penalized in today’s Big 12 title game against Texas if it does the “Horns Down” sign. You remember that don’t you? 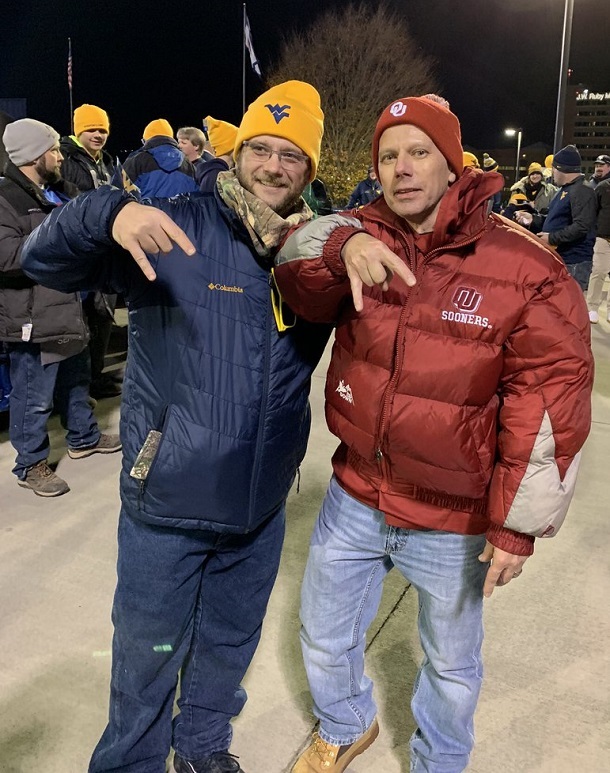 The “Horns Up” sign is one that Longhorns fans throw up to show their support of the school and the one WVU did in the opposite direction – the “Horns Down” mentioned in the paragraph above – in their game at UT this year and drew two penalties. It also drew plenty of national media attention. Most of it (well just about all of it outside of those from the University of Texas) belittling the referees for what is nonsense. It’s absurd because plenty of schools have hand gestures, even in the Big 12. TCU and Texas Tech, and yes WVU has one that’s not frequently used (no, not the one involving a certain finger) as well. If a player does something in appropriate with that, is that also a penalty? Every time I think we have reached the zenith of absurdity for what folks determine is disrespectful, offensive and hurtful, something like this comes along. By the standard set by the Big 12, if “Horns Down” is offensive to Texas, then “Horns Up” or as a friend pointed out, "hookem horns" would be offensive to their foes. Pretty simple. Anyway, that’s a brief history of the “Horns Down” dilemma and why it’s actually going to do more harm than good for Texas. And that brings us to Emily Ogden. By all accounts, Ogden is a polite young lady who plays the clarinet in the band and studies English for her major. She’s not a trouble maker in real life (Michelle Duez vouches for this so I know it’s the case) or even on social media. Yet, she made her mark there recently and we’ll also get to that soon too. After the disappointing loss to Oklahoma, the WVU band was leaving the field. And she noticed the OU band on her march back to the band’s practice facility. Ogden said she didn’t think much of it. When she got her band duties taken care of she apparently wasn’t thinking about her social media accounts – which she has Twitter, Facebook and Instagram accounts. It kind of blew up. Nearly 10,000 likes and more than 1,000 re-tweets to an account that has a little more than 100 followers. And could you imagine had she posted it right after the game? The best part is Ogden had no idea it was blowing up. Not just locally either. The retweets and likes are from all over. “I never thought that would happen. I doubt with the amount of times I tweet if it will ever happen again,” Ogden said with a laugh. 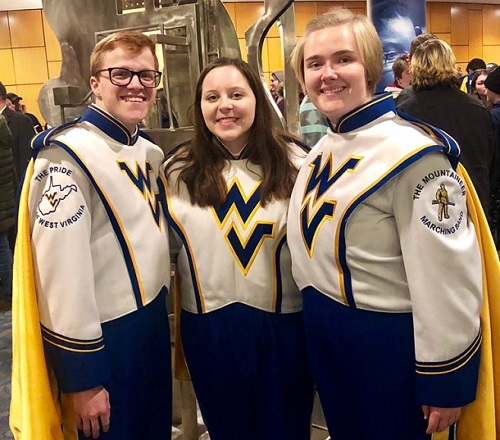 Who knows, the young lady who is thrilled to be in the band and making new friends may have a chance for something unique coming at whatever bowl game WVU goes to. She may also have a chance over the next few years. “I think we’re supposed to go to a bowl game and I really hope I can do this for all four years,” said Ogden. “It was hard to balance everything for a while, particularly in September, but I’ve figured it out. She hasn’t figured everything out thought. 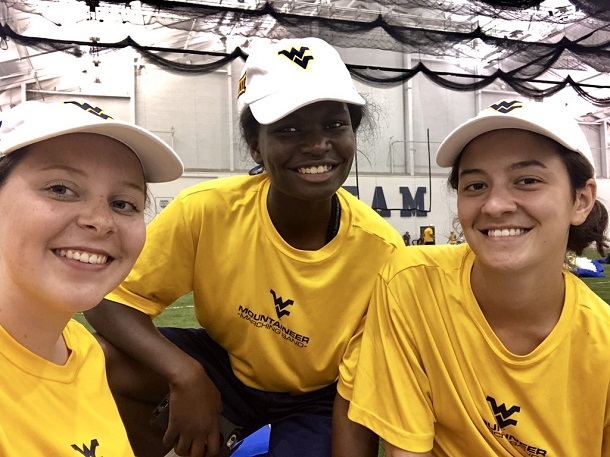 Editor's Note: Top photo shows, from left, Emily Ogden with Madewa Adeniyi, center, and Alisha Pinti - all WVU band members from Bridgeport. Second photo was posted on Ogden's Tweet from NJBoomerSooner. The bottom photo shows Ogden surrounded by East Fairmont alums Alex Kittle and Karli Pomp. All photos courtesy of Emily Ogden.